1 Every group needs a good leader. A good leader is strong. A good leader guides others. He knows what is fair. He is honest. He is a good thinker. A good leader sets a good example for his group. A good leader listens. A good leader knows what success feels like. 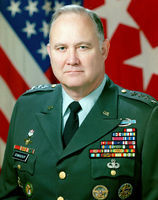 2 General H. Norman Schwarzkopf was a leader. He was born on August 22, 1934, in New Jersey. Norman grew up in a military family. His father went to West Point. West Point is a military school. It is in New York. Norman's father fought in World War I and II. He was then sent to Iran. Iran is a country in the Middle East. He trained the police force there. 3 Norman's family moved to Iran. Norman went to school there. The military asked his father to move often. The family lived in a few different countries in Europe. Norman went to school in Switzerland. He went to school in Germany. He went to school in Italy. Norman learned how to speak French. He learned how to speak German. He was known as an outstanding student.